The new net neutrality rules are the result to the tireless work of activists for the past year. Today the Federal Communications Commission has adopted strong net neutrality rules that will require all traffic on the Internet to be treated equally. There will be no fast lanes for large corporations and slow lanes for independent voices. In the days and weeks to come a lot of ink will be spilled about the significance of the FCC’s new rules and the legal nuances of where they might fall short. But for the moment, it is worth reflecting on how this victory was won. This time last year, it looked like all bets were off for net neutrality. A Washington, D.C., district court had just shot down the FCC’s previous net neutrality rules in a lawsuit brought by Verizon. The task then fell to FCC Chairman Tom Wheeler, a venture capitalist and former head lobbyist for both the cable and wireless industries, to draft new rules that would stand up in court. What followed was one of the most sustained and strategic activist campaigns in recent memory. On May 15, 2014, the FCC was scheduled to issue a “notice of proposed rule-making,” a public declaration of the kind of Internet regulations it would be pursuing. In the lead-up to that meeting, it became clear that the FCC was considering rules that would have allowed Internet service providers to offer fast lanes to companies like Netflix or Google that could afford to pay for it, while alternative media, independent blogs, and the voices of marginalized groups would have been relegated to a digital slow lane. 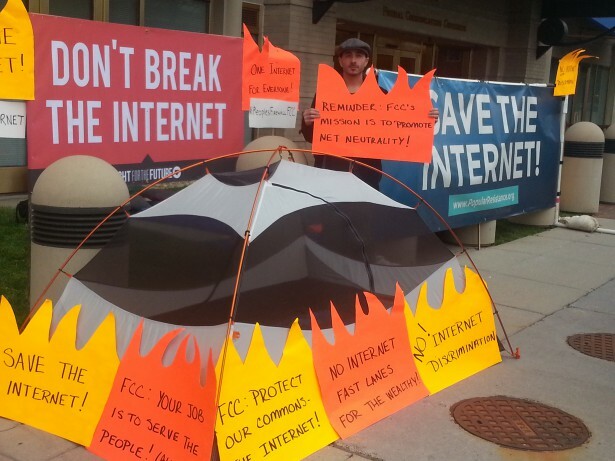 What the FCC assumed would be the quiet turning of a bureaucratic cog instead became a public spectacle and media event when dozens of activists protested and camped out in front of the FCC. As a home to bureaucrats whose work usually flies under the public’s radar, the FCC wasn’t used to being protested in person like other halls of power. That’s what made it such a good target. What started with two people sleeping outside the FCC in sleeping bags by the end of the week was a full-blown encampment of 20 tents and over three dozen people. Wheeler came out to meet with protesters. They made it clear that their demand was to reclassify broadband Internet as a common carrier under Title II of the Communications Act. 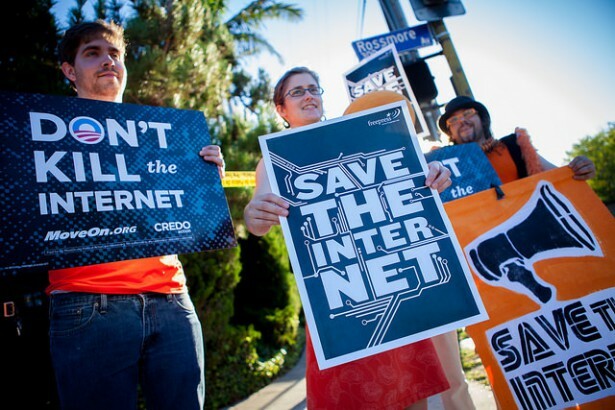 Under Title II, the FCC would have the authority to ban paid prioritization of online content. It’s an obscure tech policy, but activists have dedicated their educational efforts to making that one, succinct demand: reclassification under Title II. It worked. Occupy The FCC was the first moment that net neutrality really captured the attention of people other than technology policy wonks. John Oliver’s wildly popular “cable company fuckery” segment that transformed net neutrality into a household issue aired on HBO just a couple of weeks after the encampment disbanded. The occupation did not change the FCC’s rulemaking notice, which was already locked in at that point. But activists won one key concession from the FCC: Wheeler announced that during the period for public comments on the FCC’s proposed rules, he specifically wanted to hear if people thought Title II was the way to go. The response was overwhelming. In the following months, 3.7 million public comments were left on the FCC’s website. More than 99 percent of the comments were in support of strong net neutrality rules. That outpouring of public comments would not have been possible without close ties between grassroots and netroots activists. For example, Fight for the Future — an Internet freedom advocacy group that was also present at the FCC encampment — collected just shy of 1 million comments. After the occupation gained media attention and put Title II on the table, Fight for the Future capitalized on that momentum by creating easy-to-use online tools for generating comments. Even with so many public comments, it would have been easy for the FCC to ignore the issue and act against the will of the people. It was crucial for activists to keep the pressure on and continue to make their voices heard both online and offline. Entrenched telecom companies like Comcast and Verizon tried to stave off popular support by keeping communities of color out of the fight. “Telecom companies spent a lot of dollars specifically to ensure that race was used as a wedge in the fight for net neutrality, to make net neutrality appear to be this elite, white, insider issue that was going to harm communities of color,” said Malkia Cyril, executive director of the Center for Media Justice, which advocates for media access for marginalized populations. Internet service providers argued disingenuously that net neutrality would decrease infrastructure investment in low-income communities and increase taxes for consumers. They also donated heavily to established civil rights organizations in an effort to bring them on their side. For example the Urban League, which parroted Comcast’s position on net neutrality, has trustees from both Comcast and Verizon on its board and received over $2 million in donations from Comcast between 2012 and 2013. In response to this, the Center for Media Justice worked to build a coalition of new civil rights organizations that have already been claiming a distinct voice from groups like the Urban League and Al Sharpton’s National Action Network. 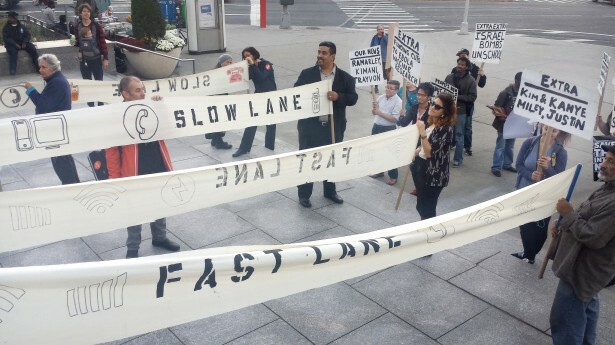 Nearly 100 organizations including Color of Change, National Hispanic Media Coalition, Presente.org, Fight for 15, and Black Lives Matter called on the FCC to reclassify broadband under Title II. “We brought in a whole new set of voices that had not previously been heard on these issues and that also provided a necessary counter to the legacy civil rights community,” said Cyril, who calls net neutrality a Civil Rights Act for the Internet. In order to build that grassroots base, advocates consistently framed net neutrality as a social justice issue, warning about how an Internet with fast lanes would harm the ability of activists to spread their message. “In order to take the fight for civil rights and dignity to the next level, we need a platform that’s as powerful and decentralized and democratized as the movement we’re trying to build,” Cyril explained. The Center for Media Justice mobilized members of its Media Action Grassroots Network to hold rallies in cities around the country in conjunction with advocacy groups like Free Press. These events called attention to the impact that a lack of net neutrality would have on communities and people of color. They were joined by demonstrations in front of FCC offices around the country, protests in front of Comcast and Verizon headquarters, and even at fundraisers for President Obama. The breaking point ultimately came in early November. President Obama released a video statement in support of the “strongest possible rules on net neutrality,” including Title II reclassification. Activists had gotten the president’s attention and made it impossible for him not to act. After the president’s statement, Wheeler immediately began drafting new net neutrality rules based on Title II. While there is reason to celebrate today, the fight is far from over. Internet providers are already lining up to sue the FCC over these new rules, hoping for a repeat of Verizon’s previous lawsuit. The FCC’s new rules should be on firmer legal ground this time around, but activists will still need to keep the pressure on to make sure their hard-won progress isn’t reversed. Going forward, however, that will mean a shift in target. After today, the FCC is no longer the bad guy. The focus will shift to telecom companies and their outsized role in the political process. “All along we’ve been doing a lot of education and advocacy, but at this point we’re ready to take direct action against these companies and target members of Congress that aren’t representing the people anymore because they’re representing telecoms,” said Cyril. Earlier this month Zeese and Margaret Flowers, another activist with Popular Resistance, were shoved to the ground and dragged out of a press conference for FCC Commissioner Ajit Pai, who was declaring his opposition to Wheeler’s newly announced net neutrality rules. Although Pai’s vote is symbolic, as one of the two Republicans outvoted by three Democrats on the commission, Zeese and Flowers felt it was important to preempt Republican spin on the net neutrality rules. Republicans have since backed down, but Internet providers still have a lot of clout, which they will be deploying in full force to overturn the FCC’s new rules. Their work will certainly be cut out for them. But today an historic victory for Internet freedom that is sure to have an impact for years to come can be celebrated.